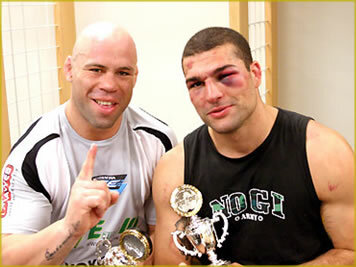 The 2003 PRIDE Middleweight Grand Prix had been a tremendous success. Not only had it provided great fights and a depth of talent, it had allowed PRIDE to crown Wanderlei Silva as the best 205 pound fighter in the world in a tournament which contained the UFC's Chuck Liddell. Two years later and the landscape had changed a little. New talent had arrived in the form of Antonio Rogerio Nogueira, Kazuhiro Nakamura, Ricardo Arona and Mauricio 'Shogun' Rua. Quinton Jackson campaigned for a third shot at Silva after making him look human but coming up short on two occasions. Former heavyweights Igor Vovchanchyn and Kevin Randleman cut down to 205 pounds to see what they could do against men their own size. Even Kazushi Sakuraba was entered to the 2005 Middleweight Grand Prix in hopes of finally securing a title. Despite a lengthy tenure as PRIDE's middleweight superman, Wanderlei Silva's crown seemed more precarious than ever before, and of all the men looking to claim it his own friend and team mate, Shogun quickly established himself as the biggest threat. In Old World, New Order: The PRIDE MW Grand Prix, Opening Round we chart the careers of the sixteen entrants to PRIDE's biggest and best tournament as well as the best days of the soccer kick and the stomp. As fighters found new ways to strike from both the top and bottom, technique and tactics shifted rapidly and we entered what this writer would describe as 'the pinnacle of PRIDE'.